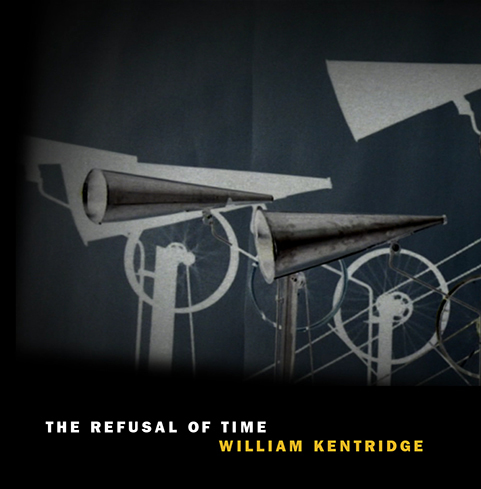 After the Met’s recent revival of The Nose, I was eager to see The Refusal of Time, a 30-minute-long video installation by Kentridge currently being exhibited at the other Met. It was first unveiled at Documenta 13 in Kassel, Germany (2012). Rumor has it that The Refusal of Time may feature in SFMOMA’s grand reopening in 2016. The installation includes the “surround-video” effect of five films moving across the space of three screens, all enhanced by Philip Miller’s score of menacing tuba drones, breathing sounds, ululation, and what resembles an army of madly hammering Nibelungs. The soundtrack is projected through looming old-fashioned movie-set megaphones. 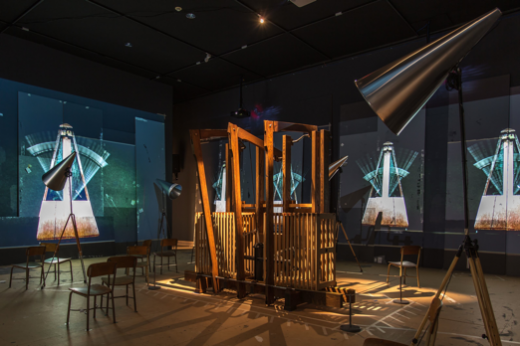 The films involve images of relativistic metronomes, Kentridge’s characteristic animations and charcoal figures, and an eccentrically parade-dance of vaudevillean silhouettes. Kentridge’s recent interest in the nature of time was given focus through the work of Peter Galison, a Harvard-based historian of science. Galison studied a 1905 paper on relativity in which Albert Einstein hypothesized that, due to the delay in signals relayed via telegraph wire, peripheral railway stations synchronized on a centralized clock were forever fated to operate seconds behind schedule. Einstein’s nascent theories about the relativity of time converged with French mathematician Henri Poincaré’s development, as president of the Bureau des Longitudes, of global time zone maps at the dawn of the twentieth century. Both scientists faced the radical idea, in a newly industrialized and interconnected world, that time is not absolute but relative and resistant to control. The sixth Norton lecture took the process of making “The Refusal of Time” as an example of what the lectures had been talking about: of thinking through material, of allowing the impulses of an image or a piece of work to hold sway and see where they led. Live music was allowed to come into the lecture form at the end of the sixth lecture. The lectures, which started with Plato, end with a black hole. Even though we weren’t starting with Plato in “The Refusal of Time,” the shadow procession came back as well, and it also ends with a black hole…. The image you see at the end, those white holes going down and down, that’s the roll from a player piano. It is both music and information…. [“The Refusal of Time”] starts with: Is a black hole the end of time? As Peter [Galison] was saying, that is one of the questions that physicists consider. But as soon as you say, right, let’s start having things disappear into a black hole, it is an immediate jump to that being, as it were, a metaphorical description of death. Is any trace left when you are gone? Is there any information, attributes of you that still float around the edge? So it is both from the psychological, or the lived sense of, what is the balance between the finality of death and the continuation of attributes of people afterward? The hot exhibit in Seattle right now is Burial by Mark Mitchell at the Frye Museum — and it’s unlike anything I’ve seen before. Mitchell is a local legend who moved from the theater world and costuming to fashion design, specializing in wedding gowns and outrageously imaginative costumes worn by burlesque performers — and, most recently, burial clothing and accessories. 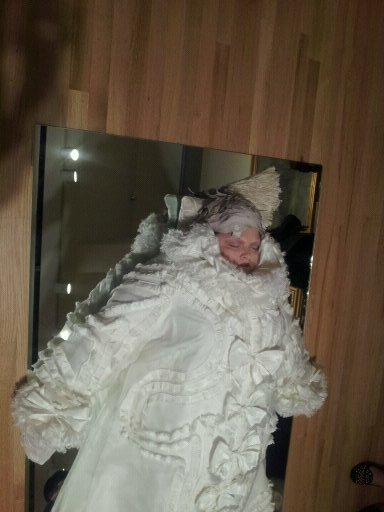 “Burial” presents a collection of these garments for the Other Side: stunningly beautiful ensembles of hand-stitched ornaments, radiant silk organza, ruffles, keepsake pockets, burial shoes and mitts lovingly adorned with knitted ribbons — all cocooning their subjects in their solemn, dignified poses. The closer you look, the more of these details become apparent, and, at the same time, mysterious and opaque. We are told that the vestments have been individualized on the inside, private messages kept secret by the deceased. 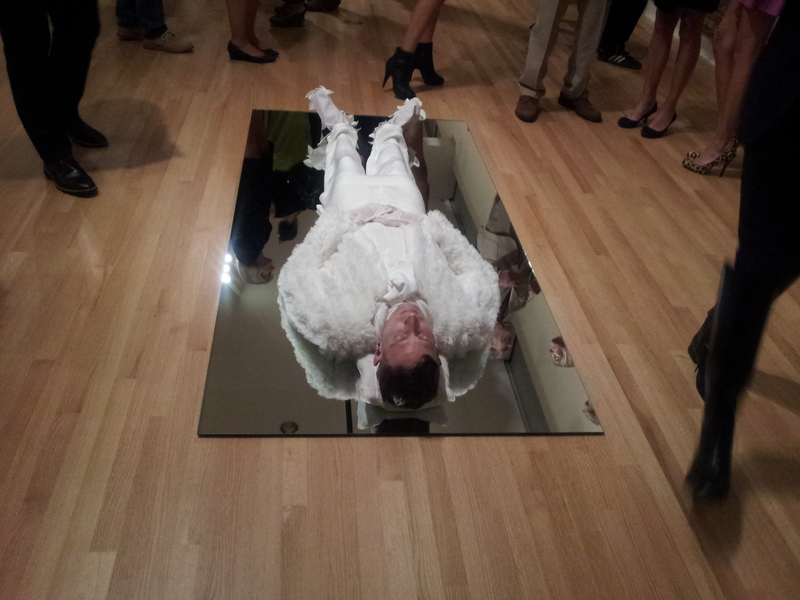 For opening night at the Frye, live models displayed the collection as they lay supine on mirrored glass panels, playing the role of corpses lovingly prepared for burial: “Buried in the earth, incinerated, or at the bottom of the sea, these vestments are intended to degrade readily, leaving nothing behind,” as Mitchell describes his creations. Each of the individual costumes was “inspired by, and created for, the nine muse/models” who presented them. 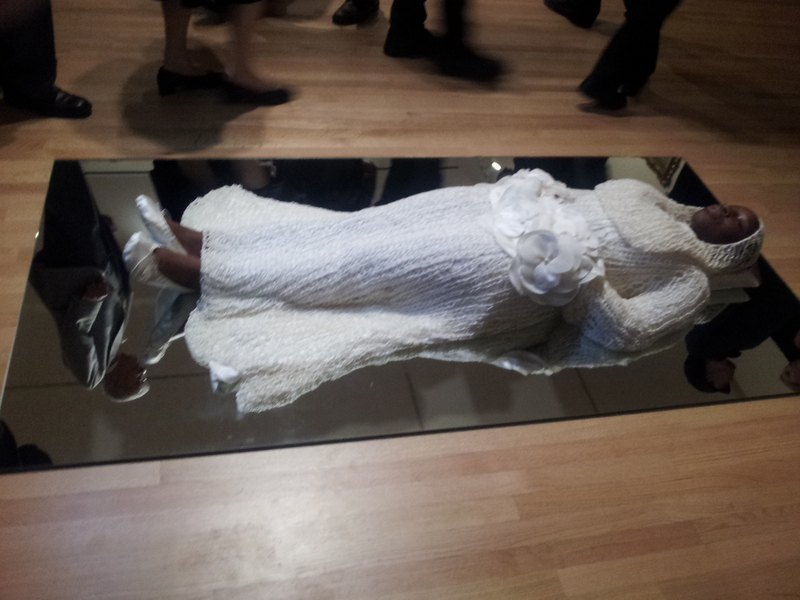 This was the only chance to see them in this “living dead” context: after opening night, until the exhibit closes at the end of October, mannequins were installed to display the “Burial” ensembles. Talk about aura: as the continually flowing crowd of spectators milled about, the models, also outfitted in waxy, corpse-like make-up, couldn’t help registering their awareness of these interlopers, no matter how hard they tried to keep eyelids from trembling. The tension was part of the experience — as was the setting, the restaged, busy salon-style display of paintings from the collection of the museum’s founders, Charles and Emma Frye. 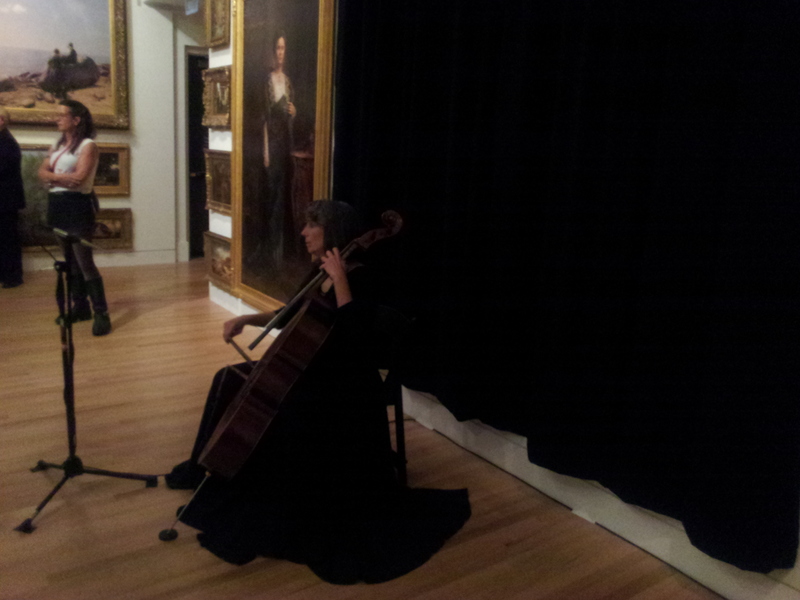 Cellist Lori Goldston, wearing another gown specially designed by Mitchell, improvised (?) a mournful meditation. September 6, 2013 • 8:49 pm Comments Off on How Much Does That Picture Cost? How Much Does That Picture Cost? Being human means dealing with limitations. I think that the overly romantic idea that somehow creativity only takes place when you’re free of restrictions keeps a lot of good art from entering the world—or, perhaps, it actually prevents a lot of bad work from entering the world…What makes the existence of art in the world so remarkable is that it comes at great cost, sometimes through enormous challenges, but almost always through the slow drip of inconveniences, frustrations, and self-doubt. This is why I am fascinated by what happens in the studio as the artist devotes her life to making artifacts that have no apparent use in the world, artifacts that are often ignored and misunderstood, especially in the church. Artists lean into that fear that every human being has—that the work we do doesn’t matter. I’m attracted to artists who, on a daily basis, are making the commitment to be a particular kind of artist, in spite of the challenges and the limitations of their life situation—artists who have the faith to keep doing what they’re doing. They don’t have it all worked out—doubting their sanity and the wisdom of their choices. But in faith, they go to the studio and work. In the process they’re strengthening my faith in art, offering me assurance, and serving as a means of grace to me as I struggle with the wisdom of devoting my life to looking at smelly pigments smeared on a scrap of canvas amidst all of the very difficult challenges and responsibilities in my life. 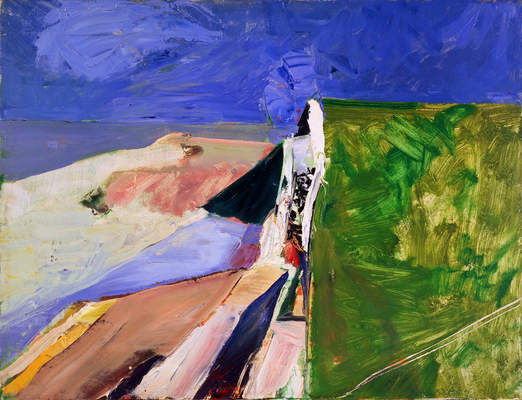 Currently on view at the de Young Museum in San Francisco is a must-see retrospective: Richard Diebenkorn: The Berkeley Years (1953-1966) (through September 29). This exhibit of more than 130 paintings and drawings curated by Timothy Burgard is a revelation on many levels. 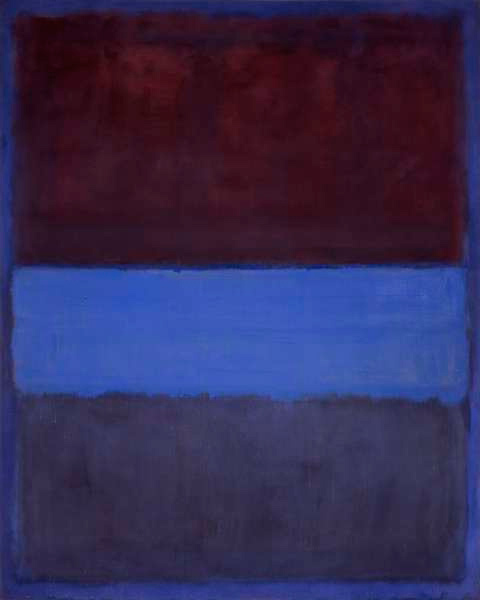 There are insights to be gained here not just into the narrative of this major artist’s evolution but about the seductions of abstract and figurative painting relative to each other, about the influence of a particular landscape, its aura and light, on those aesthetic choices, and — most intriguingly for me — about an artist’s capacity for self-critique and unexpected leaps. 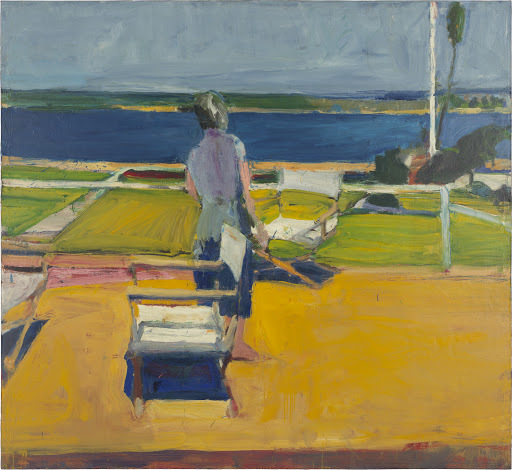 As you work your way through the context of Diebenkorn’s experiments with light and texture, the sudden reemergence of the human form is haunting, even astounding, upending comfortable notions of the historically inevitable “progress” of 20th-century painting in a way that has relevance for the similar tug-of-war between serialism and tonality among composers of this period.